We follow Roeleveld (1988) in considering this subfamily to be united by the modifications of the hectocotylus. The genus Todaropsis has been considered by some authors to belong in the subfamily Illicinae, in spite of a club dactylus with suckers in only four series, because of the lack of foveola in the funnel grove. without carpal locking apparatus on tentacular club. with foveola (except Todaropsis) but without side pockets. with thickened trabeculae on distal ventral protective membrane of hectocotylus. Hectocotylus with enlarged distal ventral protective membrane with thickened trabeculae producing a picketed effect. Figure. Oral views of hectocotylized left or right ventral arms of representatives of Todarodinae genera. A - Todarodes filippovae, distal part of right arm IV. B - Todarodes pacificus, distal part of right arm. C - Martialia hyadesi, distal part of right arm IV. D - Notodarus sloani, distal part of right arm IV. E - Notodarus gouldi, distal part of right arm IV. F - Todaropsis eblanae, distal part of right arm IV. v - Ventral side of arm. Drawings from Roeleveld (1988). Tentacular club with dactylus suckers in four series. Figure. Oral view of the tentacular club of N. hawaiiensis, 80 mm ML, Philippine waters. Drawing from Voss (1963). Funnel groove usually with anterior foveola (absent in Todaropsis) and without side pockets. Figure. Left - Ventral view of the funnel groove comparing modifications in two of the subfamilies. Drawing modified from Roper, et al. (1985). 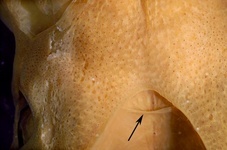 Right - Photograph of the funnel groove of Nototodarus hawaiiensis showing foveola (arrow) without side pockets. Photograph by R. Young. Martialia Left or right arm IV Yes Yes one tooth enlarged linked by intermediate ridges or plates. linked by intermediate ridges or plates. No one tooth enlarged or subequal teeth linked by intermediate ridges or plates. Roeleveld, M. A. 1988. 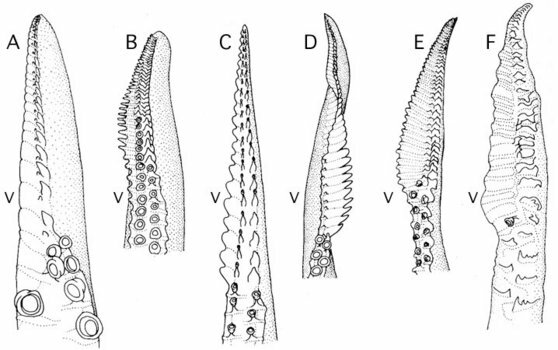 Generic interrelationships within the Ommastrephidae (Cephalopoda). P.277-314. In: M. R. Clarke and E. R. Trueman (eds.). The Mollusca. Vol. 12. Paleontology and Neontology of Cephalopods. Academic Press, N.Y., 355pp. Page: Tree of Life Todarodinae Adam 1960. Authored by Richard E. Young and Michael Vecchione. The TEXT of this page is licensed under the Creative Commons Attribution-NonCommercial License - Version 3.0. Note that images and other media featured on this page are each governed by their own license, and they may or may not be available for reuse. Click on an image or a media link to access the media data window, which provides the relevant licensing information. For the general terms and conditions of ToL material reuse and redistribution, please see the Tree of Life Copyright Policies.